T.R. Hummer is a native of Mississippi. He earned his BA and MA from the University of Southern Mississippi and the Center for Writers and his PhD in 1980 from the University of Utah. 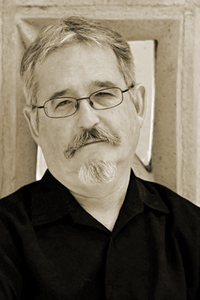 He has served as editor of The Kenyon Review and The Georgia Review, among others, and is a professor of English at Arizona State University. His publications include the poetry collections Ephemeron (LSU Press, 2011), which won the 2012 Mississippi Institute of Arts and Letters Award for Poetry, The Infinity Sessions (LSU Press, 2005), Useless Virtues (LSU, 2001), Walt Whitman in Hell (LSU, 1996), The Angelic Orders (LSU, 1982), and The Passion of the Right–Angled Man (University of Illinois Press, 1984). He is also the author of two collections of essays, most recently Available Surfaces (The University of Michigan Press, 2012), which was a selection of the Poets on Poetry series. Among his honors are a John Simon Guggenheim Memorial Fellowship and an NEA Fellowship. Hummer has played saxophone in the Skinner Brothers Band and the Richmond-based jump blues band Little Ronnie and the Grand Dukes (Young and Evil, Planetary Records, 2001).